The Tower of Hanoi backup strategy, named after the classical Tower of Hanoi puzzle (which consists from moving eight disks between the three spines, with no larger disk put over a smaller in a single spine), is a method originally used for backup tape rotation, but now it is a universal backup strategy. In the Tower of Hanoi backup retention scheme, the first media set is used every second day, the second media set is used when the first set is not used and is used every fourth day, the third media set is used when neither of the previous sets are used and every eighth day and so on. Note: As compared to Grandfather-father-son rotation schedule, this one can employ more backup media sets and save a deeper backup history. 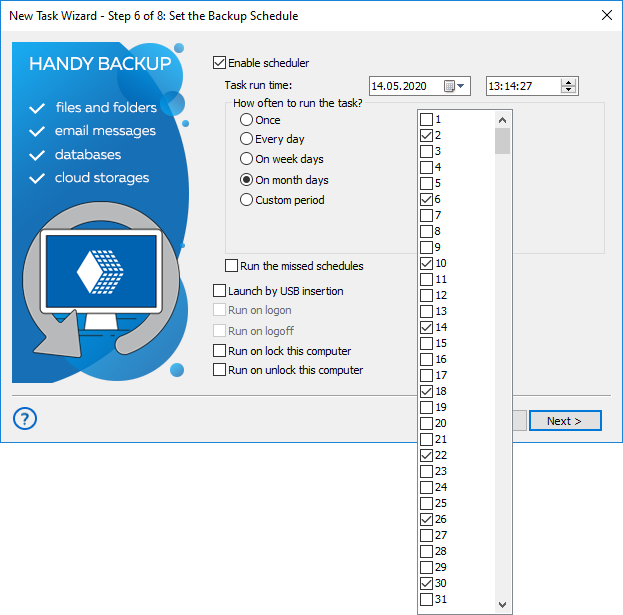 This backup rotation schedule requires only five backup media sets to perform daily backups during a month, for instance. 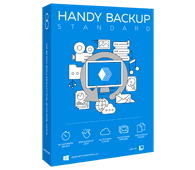 The simplest Standard edition for home users fully supports all components needed for the Tower of Hanoi backup strategy, allowing saving data to three or more storage sites. Create a new Handy Backup task for the “first tower” backup. On the Step 2, select the dataset to make Tower of Hanoi backup. On the Step 3, select a new data destination that will serve as the “first tower”. On the Step 6, schedule this task to execute at each other day. Set the name of this task as the “First Tower Backup”. Create a new backup task and select the same dataset on the Step 2. On the Step 3, select the “second tower” backup storage. On the Step 6, set up the backup for the second day and a repeating period of four days. Name this task as the “Second Tower Backup”. Again, create a new backup task. Select the “third tower” vault, and on the Step 6, set up a fourth day as the starting day. Also, make a repeating period of eight days for this task. Name it the “Third Tower Backup”. Schedule it to start on the 8th day and a 16-day repeating period. Of course, this task will have a name like “Fourth Tower Backup”. These are all the operations to set up a Tower of Hanoi backup system in Handy Backup! You can select any preferred scheduling period instead of days, and also you can add any depth to this algorithm by using powers of two for an initial interval between tasks and the doubles for this interval for repeat. Each additional backup media set added to the rotation doubles the deepness of backup history. The program uses it only when the previous sets are not in use. Thus, the later a backup media set is added to the history, the older files it stores and the less time a program will use it. Caveat: The Tower of Hanoi backup schedule enables one to have a deep backup history, but does not allow storing many recent backup copies, as a daily backup is erased in two days, for example. Get Handy Backup for easy implementation of Tower of Hanoi backup method! Download a newest version for a free 30-day trial!